While a member of two National Championship teams at Florissant Valley in 1970 and 71, Pat received Region XV1 First Team honors and was invited to the Olympic trials, making it to the last cut in 1972. 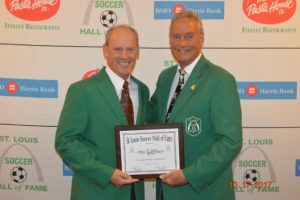 Pat’s amateur career consisted of playing first and winning a League Championship, State Open, and National Open Champions in 1972 with the Busch Soccer Club. For the next 4 years Pat played for Yost Chevrolet. His St. Louis soccer career was cut short for he joined the Air Force, but his knowledge and love of the game did not stop. Pat captained the Air Force Team from 1982-86 and then again in 2000-04 in the United States and in Kyrgyzstan. Returning to the St. Louis area, Pat became a part of the Veterans Cup Team sponsored by Kutis. A special thanks to you Pat for defending our country and your continued service in the United States Air Force.